More than 80 percent of U.S. business executives say the upcoming presidential election is not impacting their decisions about hiring, capital expenditures, or business expansion. That’s according to a recent survey by the American Institute of CPAs. 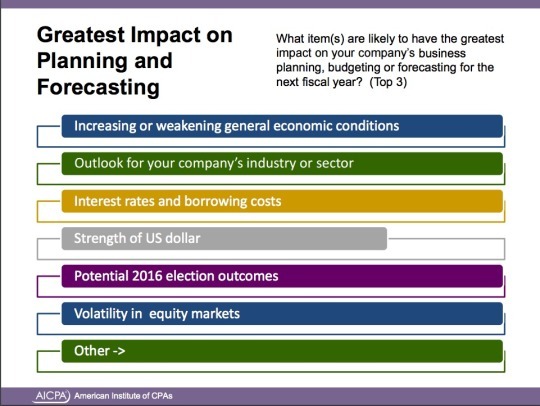 A set of election-impact questions was included in the first quarter AICPA Economic Outlook Survey, which gathered 540 qualified responses from CPAs who hold leadership positions, such as chief financial officer or controller, in public (14 percent), private (71 percent), and not-for-profit (13 percent) organizations of all sizes, and across a broad spectrum of industries. Business executives ranked the election fourth among factors impacting their companies’ business planning, budgeting or forecasting for the next fiscal year. More important? General economic conditions, their industry-specific outlooks, and borrowing costs. Just 13 percent of survey respondents said they will defer hiring until after the election and 5 percent said they will reduce hiring before the election. Only 10 percent said they will defer capital expenditures until after the election and 8 percent said they will reduce it prior to the election. A copy of the full report can be found on aicpa.org.